For the last decade I have been travelling to Majorca once or twice a year and in between visiting mainland Spain too, and what has been interesting to see on the island of Majorca is the sudden emergence in the last year or two of Tapas bars. Hundreds of years ago when I first started going to Spain, well, Andalucia in particular, there was no such thing as a Tapas bar. You would simply go in a bar for a drink and a small plate of food or olives would be placed on your table and each time another drink was ordered you would get another small plate of something else to snack on. 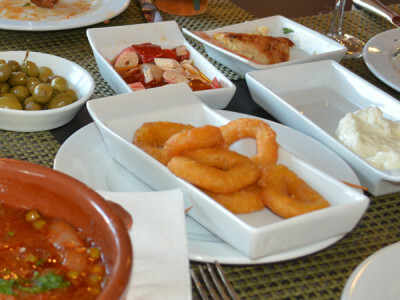 These small snacks are called tapas and come free with your drink and are brilliant! A couple of years ago I took my family to Nerja to visit my parents whilst they spend November at their timeshare and we had a nice apartment for a week and when we went into town we would stop at bars on the way as it was quite a way and pause for a drink at a bar or café and we would be offered a tapa of our choice with each drink. In the old days these tapas were perhaps just a couple of bites or some olives but here we were getting a small bowl of Fabada Asturia or a bowl of estafado, which is a stew or some tortilla or my favourite of Habas con Jamon Serrano, broad beans with Serrano ham, and what I liked best was that you paid €1.20 or €1.50 for the drink and then got a small bowl of something to eat for free and after crawling about 2-3 bars you had had enough to eat that you didn’t need to buy lunch! Great idea! But I suppose because of the popularity of tapas and tapas bars opening up worldwide, the Spanish have caught on and now offer these small tapas from anything of €2.50 and upwards. Usually upwards I may add! So to my last trip to Cala Bona where there were no tapas bars, there are now several and they offer a huge variety of them but of course if your order a selection you are now looking at €20 0r €30 euros just for your tapas. I expect this outside of Spain as we do go fairly often to tapas bars here in Berlin, but it’s sad that this wonderful tradition has changed in parts of Spain. Of course these are the typical tourist traps you expect and avoid. I always hit the back streets when I want some good traditional food and find where the locals are eating. They love it too when you site there and order in Spanish and they love it that your kids are there and you get free tapas and we usually order some food too! So the tip is to head to those back streets or find the “Old Town” like we did in Benidorm and just sit yourself in a bar with locals and soak up the atmosphere and free tapas. Of course if you want to remain a tourist and sit on the waterfront overlooking the harbour don’t expect to meet any locals!